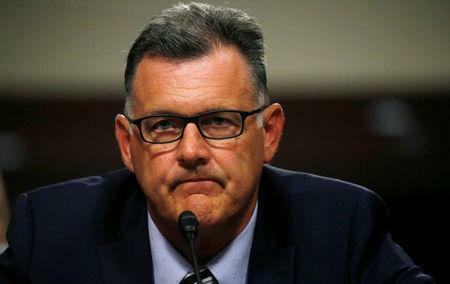 (Reuters) - Steve Penny, the former USA Gymnastics president, was arrested on Wednesday night in Tennessee on charges he tampered with evidence in the case of Larry Nassar, the disgraced team doctor convicted of sexually assaulting athletes, the U.S. Marshals Service said. Penny is due to be extradited to Walker County in Texas to face allegations he removed documents from the USA Gymnastics national team training center there, the U.S. Marshals Service's statement said. Nassar was sentenced in February to up to 125 years in prison after some 200 women, including Olympians, testified about decades of abuse at his hands. Some of the abuse happened at the Texas training center, known as Karolyi Ranch. Bowing to criticism he did not do more to stop the abuse, Penny resigned last year after more than a decade running the sport's national governing body, saying he was heartbroken to learn of the accusations. An indictment charges Penny with ordering documents related to Nassar removed from Texas and delivered to the USA Gymnastics' headquarters in Indianapolis, some of which remain missing, the U.S. Marshals Service said. The charge carries a maximum sentence of 10 years in prison. Marshals found Penny in a cabin in Gatlinburg in Tennessee's Smoky Mountains. Penny's arrest comes after Mary Bono resigned on Tuesday as USA Gymnastics' interim chief after only a few days on the job after she drew fire from prominent athletes for a tweet she sent criticizing Nike Inc's use of former NFL quarterback Colin Kaepernick in an ad campaign. Kaepernick sparked a national controversy by kneeling during the national anthem. The Walker County district attorney's office could not immediately be reached for comment, and it was not clear whether Penny had a lawyer.